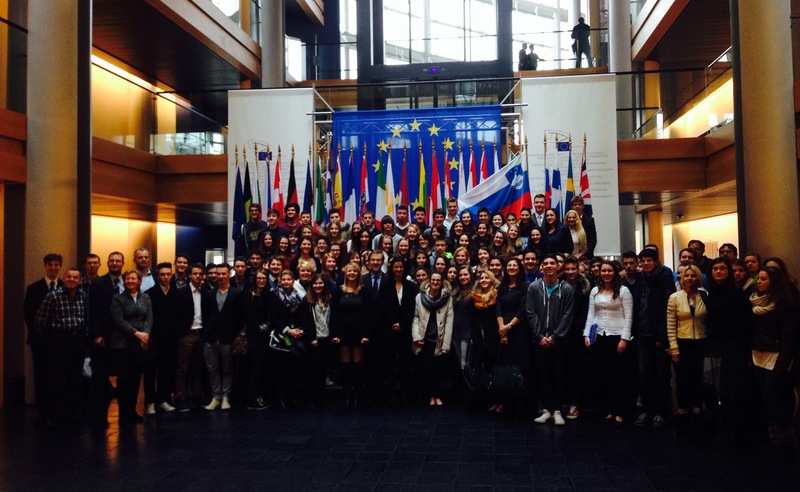 On 5th February 2014, at the European Parliament in Strasbourg, MEP Zofija Mazej Kukovič (EPP/SDS) hosted together with all other Slovenian MEPs almost 140 youth from the Slovenian minorities in Austria and Italy. They warned them that many in Austria and Italy do not know to this day what the Slovenian minority actually is. Despite a shared border and the closeness of Slovenia, bilingual boards are still subject to the rule that at least 17,5% of the local population must speak Slovenian. ?I am honoured to meet so many young from the Slovene speaking minorities in Austria and Italy. This is an event without comparison, especially since I am proud to speak Slovenian in the European Parliament. For this reason, I am even happier of Slovenian visitors here. You are the defenders of the Slovenian identity? said Mazej Kukovič. During the debate, the young members of minorities made it clear that the biggest problem they face in the time of crisis is the lack of employment opportunities. Mazej Kukovič pointed out that ?Each European law is linked with providing a solution to youth unemployment. Concrete answers are found in the guarantee schemes for the young, who should, after four months of unemployment, receive an opportunity for an internship, further studies or functional knowledge?. She added: ?An important contribution to finding solutions is the mobility related to studies, employment or entrepreneurship, which are supported by the Erasmus and Eurostars programs. Slovenian education programs should focus on encouraging creativity, innovation and be orientated towards the global economic space, not the memorisation of thousands of bits of information.? Amongst the 5 million unemployed youth in the EU, with over 30.000 in Slovenia alone, many suffer from what is known as structural unemployment. Furthermore, educational systems do not pay sufficient attention to the needs of the market. One example is the area of ICT, where the EU will need 1 million experts. Demographic changes have also increased demand for medical professionals, of which there is an insufficient number in Slovenia. Furthermore, less than 5% of the population is professionally involved in agriculture and food production. ?When producing food, the hoe must be connected with a computer! This presents an opportunity for young people with the appropriate education. It is also for this reason that the next financial perspective until 2020 is oriented towards this goal. The educational system in Slovenia is part of the problem, but it must become part of the solution? Mazej Kukovič concluded.